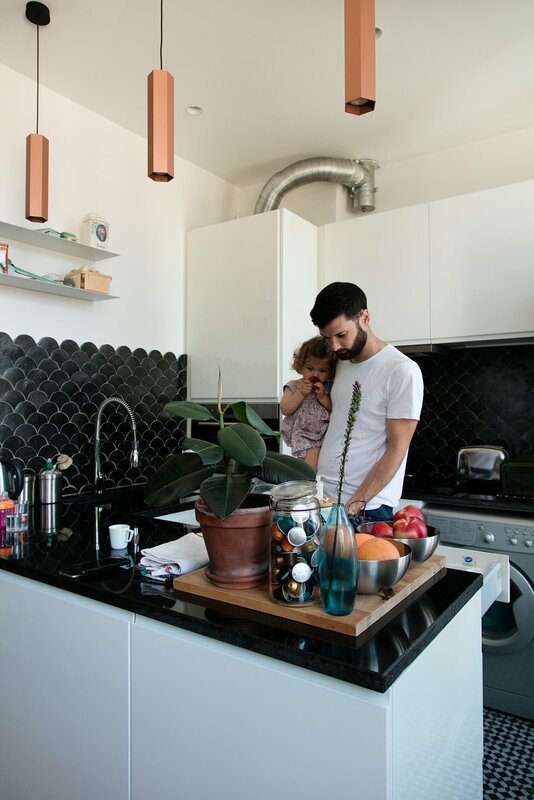 When Emma and Ghislain Borga fell under the spell of this apartment, their first challenge was to try to imagine themselves living there, as it once again looked like one of those “turn of the century” spaces, with a succession of small, dark rooms. So, we spent three months taking it apart. Pushing back the walls and, above all, finding the light. 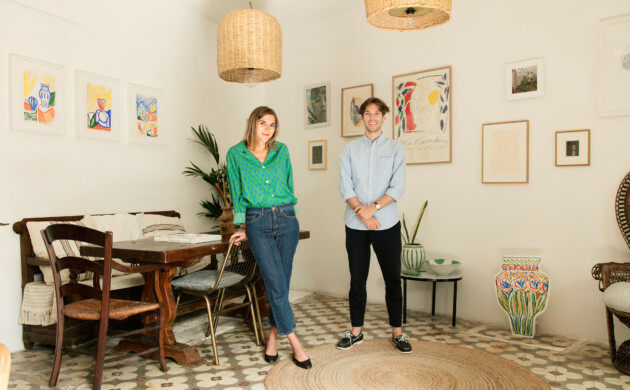 With the help of Marseille interior designer Julien Fuentes, the young couple rediscovered their creative soul and, in the place itself, unsuspected character. Together they designed a room with multiple uses, open and devoid of partitions, orchestrated around an extensive library in an intense shade of blue, a nod to Ghislain’s dream. For Emma, it would be decoration. 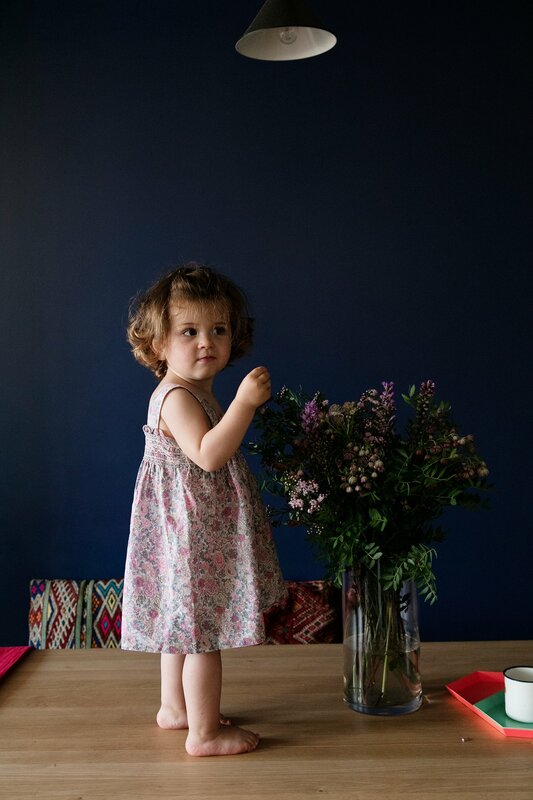 For her, with her Mediterranean background, finding furniture and objects is always a real treasure hunt, and she does not hesitate to take her family when she goes out searching on Sundays. 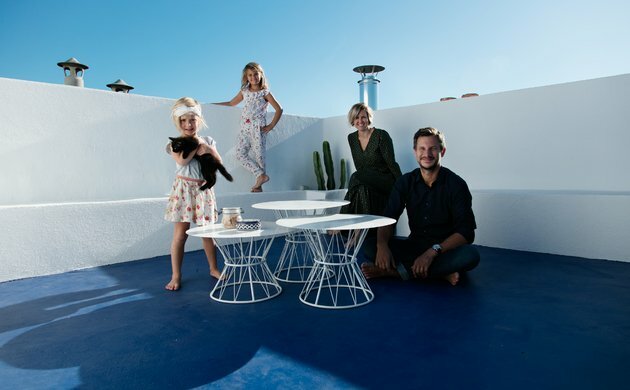 A blend of contemporary and antique, the result reflects the family’s taste for the unusual and intriguing. 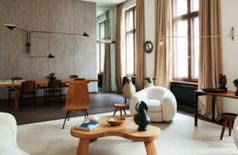 A sensibility shared by their friends and relatives, who are just as fond of design and thoughtful details as they are. Emma, who are you? Tell us about your background. Although I don’t have brown hair and eyes and an olive complexion, I would say I am truly Mediterranean. I grew up near Montpellier where I began my studies and met Ghislain, my husband. Then I continued my studies in Paris, but there was less sunshine there than there is by the sea. So Ghislain and I decided to go back and live in the south, in Marseille. And it was here, in the Phocaean city that Charlie, our daughter, was born. When you bought this apartment, you changed everything. Tell us more about it. 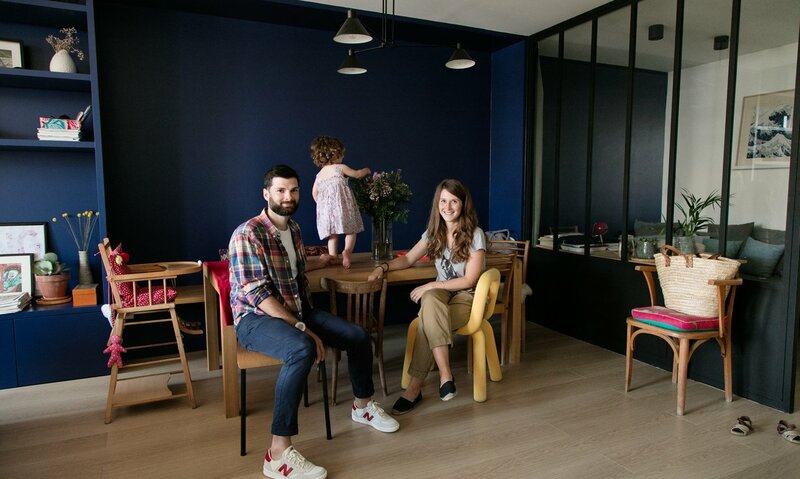 We wanted an apartment we could create for ourselves where everything needed to be done – or at least redone – and above all not standardised. This apartment, which is in a typical Marseille building, had already been modified by the former owners in the early 90s but it was far from to our liking. However, it had great potential. We wanted a large living space, open and with no partitions, combining living room, dining room and kitchen and allowing each room to have a tantalising view. Basically, a large open space, ideal for family life and sharing with friends. The help we had from Julien Fuentes, an interior designer in Marseille, made the definition and shaping of a large part of the apartment possible. He designed the library and the glass roof of the office that we wanted and he put his own stamp on it, just as he did in the bathroom and kitchen, but he took our expectations and tastes into account. The work took a little over 3 months. In terms of style and decoration, how did you divide the roles? 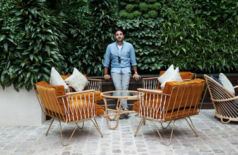 Part of the decoration came about naturally through the custom-made furniture Julien designed and the presence of noble materials and colours chosen with Ghislain. As for the other furniture and small decorative objects, I try to find as many pieces as I can in garage sales and flea markets where I love to go on Sundays. But we also bought a large proportion of it new! 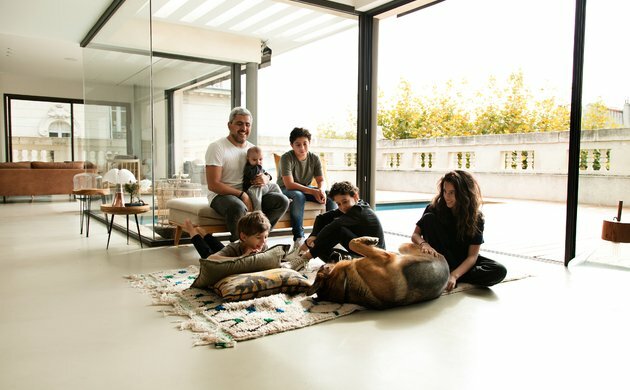 And to be honest, the other members of our family, who are equally fond of this kind of place, are not total strangers to some of the decorative pieces we have here. How do you choose your furniture? Do you have a favourite era? No, I don’t have any favourite era. 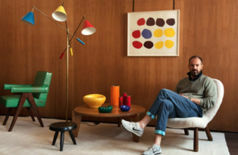 I like sleek, modern furniture as much as the furniture from the 1950s or sometimes much older. In my opinion, different periods can live in perfect harmony with each other and find their place in the same space. We try as much as possible to choose our furniture for its originality. Do you have a current favourite colour or material? Burgundy! And as far as my favourite material at the moment is concerned: all of them, as long as they have patina. The cheapest item you are most proud of? All the many mismatched vintage earthenware, porcelain and other plates that we mixed together to decorate our wedding tables. Where do you go hunting for bargains and inspiration? Nowhere in particular. I go to Emmaüs, to the garage sales (more rarely the flea markets) depending on where I am at the weekend. Alternatively, the family’s attics provide an interesting playground too. Our inspiration comes mainly from found objects, but also from our travels. And your favourite restaurants, here or elsewhere? The Longchamp Palace and La Mercerie in Marseille. Greece Invites itself to the Madrague District.